If we look at most cases that are between the $20 to $30 price range, we can agree that they don’t necessarily have as much of a premium element to them, but rather, they basically tend to focus on protecting against scratches only. Well, if you plan on getting Adopted, just know you’ll be treated to exciting iPhone 5 cases that not only offer great protection, but they don’t skimp out when it comes to looking good too. First up on the list is the Leather Wrap case, which stands out most for its timeless and vintage appearance. Specifically, it’s the genuine Clemence-like leather finish of the rear that gives it an eye-catching look – while at the same time, it’s able to give the case an overall clean finish at all times. Indeed, it’s form fitting and does a wonderful job at protecting the handset’s back and sides, but the non-conductive metalized frame doesn’t cover the front. Secondly, the Cushion Wrap case is undoubtedly the most interesting out of the bunch that we’re taking a look at right now. Why’s that? Well, it reminds us of a piece of furniture – like a living room sofa, due to upholstered pattern of its rear casing. Furthermore, that pattern design is stain-resistant and has a soft touch to its finish, which gives it a distinct feel in the hand. 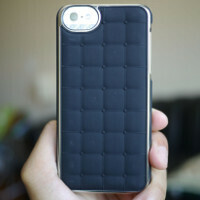 Just like the Leather Wrap case, it also features the same non-conductive metalized frame. And finally, we have the Forged case that’s the most generic of the bunch. Lacking a cool looking pattern design like its siblings, the Forged case looks like any other hard plastic protective case out there, but it separates itself thanks to its high gloss finish and precision cast metal button guards. To be more specific, it’s the gold trim around the volume control and bottom section of the case that gives it a subtle contrasting look. Unlike the other two cases, which are snap-on ones, the Forged case is comprised out of two sections that can be finicky removing once the handset is in place. These aren’t cheap, really, seeing that all three of these Adopted cases retail for $49.95 each. Sure, they’re expensive and whatnot, but there’s a very good reason for that. Simply, they have a premium look to them on top of featuring your standard level of protection against scratches and minor dings. If you desire premium cases with cool designs, you might find these Adopted cases suitable. Nice but why is front is no shown and also apple logo is covered by it.